Speakers: Mariangela Petruzzelli, founder and producer of the Festival “Malta meets Matera-Matera meets Malta®”; Cav. Josephine A. Maietta-President AIAE-Association of Italian American Educators; Leonardo Metalli- journalist Rai and Founder of “Mad for Italy”; Anthony Pasquale, journalist ICN-Radio-NY. Mariangela Petruzzelli, TV journalist and author, originally from Basilicata (Lucania), is the founder of the project, together with Maurizio Urso, who has been working as a photographer in Malta for more than twenty years. The Festival offers social and cultural value by exchanging and sharing experiences and promoting the two territories of Malta and Matera from various perspectives such as marketing, tourism, and history. This synergy will culminate in the signing of a socio-institutional agreement that “twins” the City of Valletta and the City of Matera. One of the most important elements of the Festival will be the photography exhibition by Maurizio Urso, who, together with a team of local professionals, aims to bring together La Valletta and Matera by sharing common elements as well as celebrating unique ones. The exhibition will open next December in La Valletta and will continue in August and September in Matera. 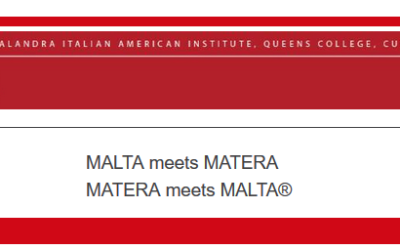 The project “Malta meets Matera-Matera meets Malta®” has entered into an agreement with the Municipality of Grassano (MT), the native town of New York City Mayor Bill de Blasio’s mother, Anna Briganti, in order to create the itinerary “Via dei Cavalieri di Malta,” involving all four cities–Grassano-Malta-Matera-New York–in which the cultural heritage of the Malta Knights has been significant. The Festival will start next December with the exhibition at La Valletta-Malta, in the Government Palace, and it will continue in August-September 2019 in Matera, at Palazzo Viceconte and in the museum space Ex-Ospedale San Rocco. The project is divided into different sections, including: photography; music; theater; literature; story-telling; cultural heritage and architecture; travel and documentary film; tourism; and food and wine. Beside the exhibition there will be a program of meetings with architects from Malta and Matera who will focus on the value of the European cultural heritages of the two territories. The Miss Chef® International competition is part of the Festival. This competition has taken place in New York since 2014. During the Festival this year, the competition will feature chefs from Matera and Malta as well as wine and food tastings and local products to promote the local food and tradition.